Narrow based baby carriers or "front packs," such as the popular Baby Bjorn*, are controversial in the baby wearing world. Often referred to by the derogatory term "crotch dangler", this style of carrier is not considered ideal in terms of comfort or support for either the baby or the wearer. Despite their flaws, these carriers are widely available and are often the first carrier a new or expectant parent tries. While they are not actively harmful when used to carry babies with healthy hips, there is some evidence that this type of carrier can exacerbate hip dysplasia due to the non-supportive narrow "seat" this carrier offers. (More info on baby carriers and hip dysplasia here: http://hipdysplasia.org/developmental-dysplasia-of-the-hip/prevention/baby-carriers-seats-and-other-equipment/) Soft structured carriers like the popular Ergo* offer a wider seat and better weight distribution, but may not be affordable. Enter the scarf hack! 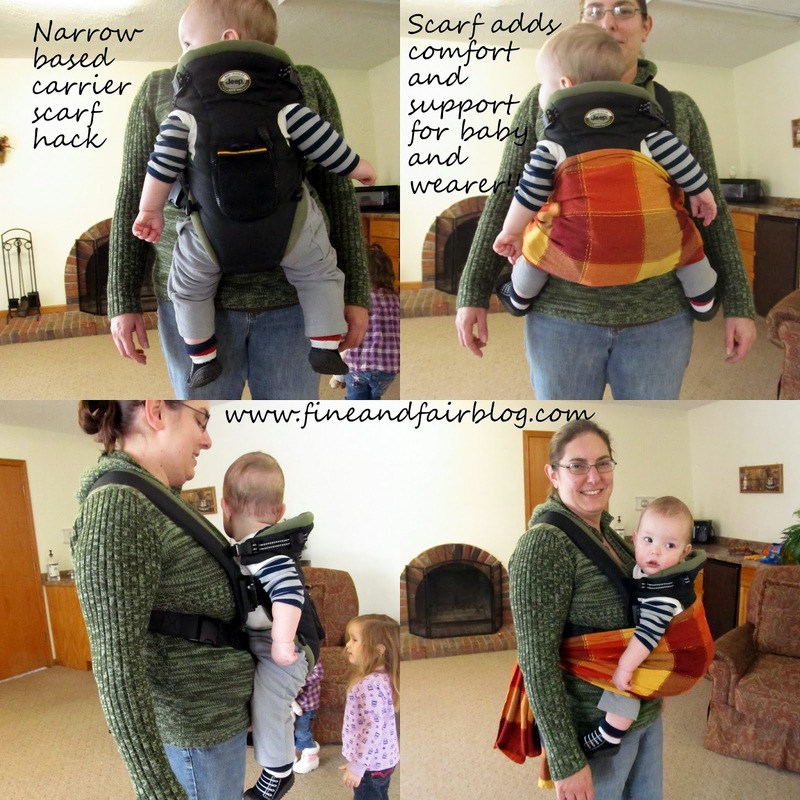 Your Baby Bjorn or other narrow-based carrier can be made more comfortable and supportive for both baby and wearer with the simple of addition of a wide scarf, towel, or similar sized piece of fabric. This helps to achieve the recommended knee-to-knee supported seat with knees higher than bum. Really great idea, thanks for sharing! you can also see how the carrier causes the wearer's back to arch inwards - will cause discomfort after a short while :( come to the snuggly side and try one of the many ergonomical wraps and carriers available! Check out local sling meets and sling libraries - they are a great source of advice and comfy slings! How long is the scarf that you used? Looks comfy and also creates mutually enjoyable with mom and baby. Always remember that providing safety carrier is really vital esp. for babies. Interesting, found a baby sling library tomoz in local area but if unsuccessful I will definitely be trying this tho, I love the closeness but hate the achiness after and can't be much comfy for baby in the baby bjorn. Whilst they are not positively harmful whenever used to have babies along with healthy sides, there is a few evidence this type of service provider can worsen hip dysplasia due to the non-supportive narrow. Thank you thank you thank you!!!! I have this same carrier and my husband is very simplistic and believes there is nothing wrong with it so I can't justify buying the ergo or anything else. 2 kids later and it goes rarely used because I have lower back problems and it KILLS after only 5 minutes. So glad there is an easy way for me to fix the one I have...cuz lets face it...its fix what I have or go without in my house!! صيانة ال جي صيانة متميزة من مركز صيانة معتمد باسعار مناسبة وخدمات عالية ..
actually I was searching for baby Carrier Scarf Hack and got your site .thank you for the article. شركة امتار الان تقدم اليكم الكثير من الخدمات غير عزل خزانات بالرياض لدينا تنظيف ونقل اثاث علي اعلي مستوي من التميز في العمل استمتع الان بالكثير . استمتع الان بالكثير من الطرق والخدمات المتميزه . الان معكم صيانة ويرلبول علي اعلي مستوي من التميز في العمل استمتع الان بالكثير من الخدمات وحملات الصيانة المدجانية علي يد عمالة متميزه في مصر . احصل الان من خلال موقعنا الكتروني علي اكبر خصومات متميزه علي اعلي مستوي من لتميز في العملشركة تنظيف شقق بالمدينة المنورة علي دي متخصصين علي اعلي مستوي . من افضل الخدمات المتميزه علي اعلي سمتيو من التميز استمتع الان بالكثير من الخدمات العالمية في شركة مصاعد كهربائية علي اعلي جودة في المملكة العربية السعودية . شركة اجازتنا علي اعلي مستوي في مصر عروض رحلات الغردقة تقدم اليكم رحلات متميزه جدا ترفهيه ودينية باقل الاسعار علي اعلي جودة في فنادق عالمية ومتميزه . Thanks to Dr.Unity a real online love spell caster for bringing back my husband and brought great joy to me and my family today!, I'm so excited share this testimony about how i got my husband back, after he left me and our 3 kids for another woman!!. After 12 years of marriage, me and my husband has been into one quarrel or the other until he finally left me and moved to California to be with another woman. I felt my life was over and my kids thought they would never see their father again. i tried to be strong just for the kids but i could not control the pains that torments my heart, my heart was filled with sorrows and pains because i was really in love with my husband. Every day and night i think of him and always wish he would come back to me, I was really upset and i needed help, so i searched for help online and I came across a website that suggested that Dr Unity can help get ex back fast. So, I felt I should give him a try. I contacted him and he told me what to do and i did it then he did a (Love spell) for me. 28 hours later, my husband really called me and told me that he miss me and the kids so much, So Amazing!! So that was how he came back that same day,with lots of love and joy,and he apologized for his mistake,and for the pain he caused me and the kids. Then from that day,our Marriage was now stronger than how it were before, All thanks to Dr Unity. he is so powerful and i decided to share my story on the internet that Dr.Unity real and powerful spell caster who i will always pray to live long to help his children in the time of trouble, if you are here and you need your Ex back or your husband moved to another woman, do not cry anymore, contact this powerful spell caster now. Here’s his contact: Email him at: Unityspelltemple@gmail.com , you can also call him or add him on Whats-app: +2348071622464 . تبلیغ کانال تلگرام یعنی معرفی کانال تلگرام شما به کاربران تلگرام .